We have seen that the Board of “Education” has created an inflated, “On-Time” graduation rate to make the numbers look better. 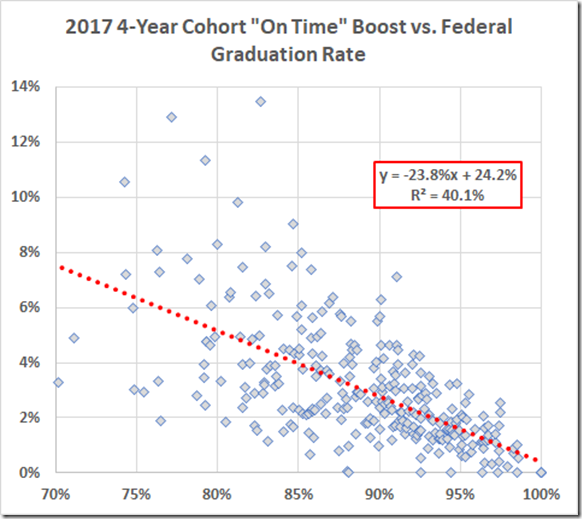 This year that count inflated the state average cohort graduation rate by 2.8% and the Richmond average by 6.7% over the federal (advanced plus standard diploma) rate. (Actually, by more than that; see below). 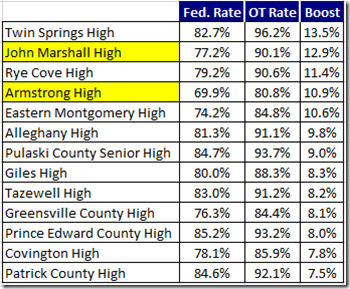 Today let’s look at the effect of that per high school. 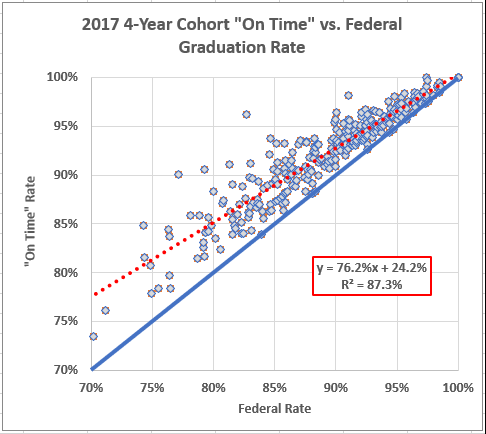 To start, here is the On Time rate vs. the federal rate for the 296 high schools for which the 2017 4-Year Cohort Report includes both numbers. 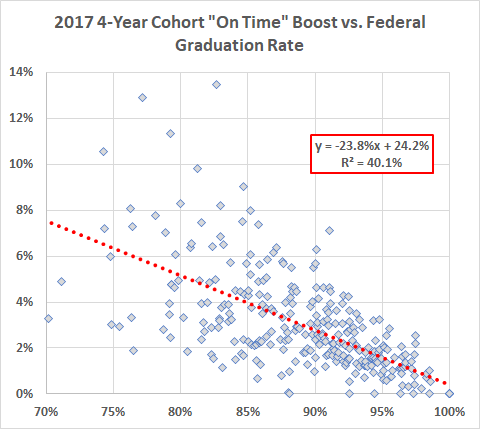 The outlier at 13%,16% is Richmond Alternative School, the dumping ground for difficult students (boosted by 3%, as if that could make a silk purse out of a 13% graduation rate). The other outlier at 58%,58% is JM Langston Focus in Danville, which looks to be a similar outfit. Let’s leave those two off and see what we get. 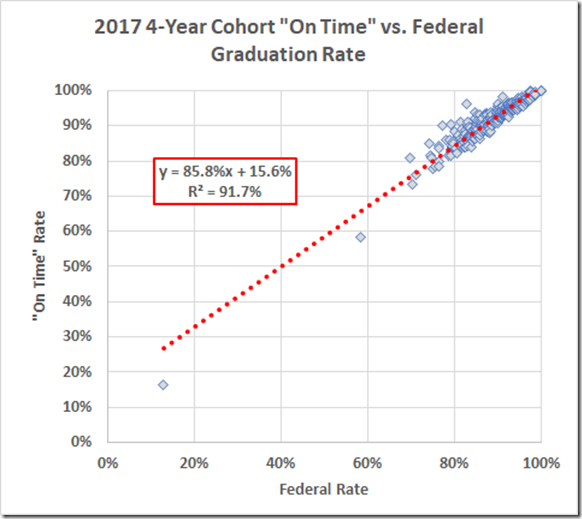 The blue line is the “truth in graduation rates” line; very few data points lie on it. 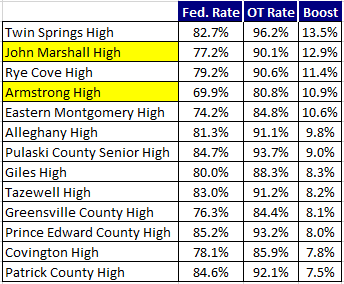 Doubtless the Richmond School Board is not annoyed by the 12.9% gift at Marshall or the 10.9% bonus at Armstrong. 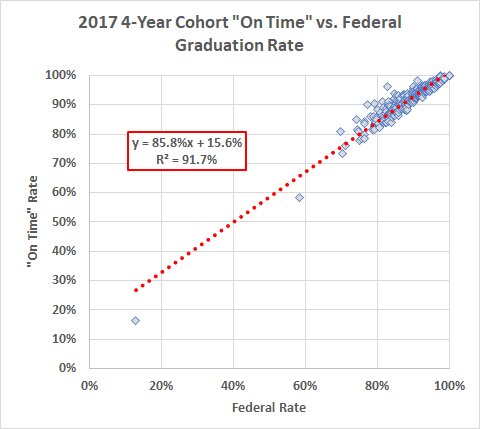 If this were not enough official deception, remember that the Federal rate already includes about a 5% finagle factor because they are starting to use “credit accommodations” that permit counting Modified Standard diplomas as “Standard.” You can be sure they won’t tell you how large that hidden boost turns out to be.